Following on from the earlier post of our Adventures in Orkney- What You Need To Know and for those who are absolute suckers of big erect stones (schoolboy giggle), then you might like the below of our top sites to see in Orkney. Orkney has it all, a collection of fine features that we saw on our adventures in Orkney. Not a comprehensive list, but I’ll add to it later when I finish the video. Moody, atmospheric, yes, they both describe me and this place. The Ring of Brodgar is one of the largest neolithic henges in Britain and an iconic site in the ancient history of Orkeny. Set against a dramatic sky and the moody waters of the Harray and Stenness lochs, gives this near perfect stone circle of 104 metres across a very atmospheric place for prominent community ceremonies. Erected 4500 years ago, these stones are much smaller than those of Stenness with 27 of the original 60 stones still stand and watch as visitors pass. 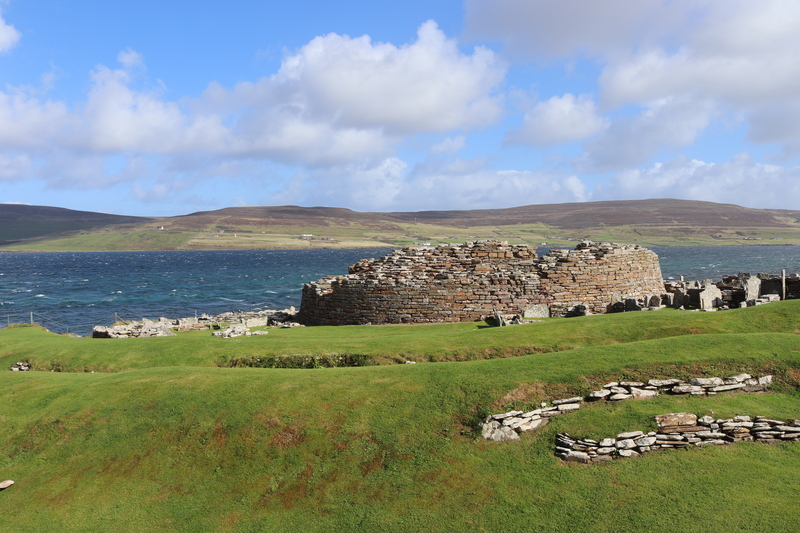 Heading north on Mainland to The Broch of Gurness, we find a wallet full of cash. Not quite Viking or Iron Age treasure, especially as we handed it in (yes all of it, every penny). Located on a windy shore overlooking the nearby island of Rousay, at first glance, the place looks inhospitable, the water of Eynhallow Sound looks deadly choppy with a constant battering from the wind. But back 2000 years ago, the climate a a couple of degrees warmer and this was one of the most important settlements in Orkney with up to 14 houses around the broch. The broch itself, a fortified tower, would have been imposing, up to 10 metres tall. I can’t build a greenhouse base 2 bricks high never mind a lichen spotted drystone wall that high. Less busy than Maeshowe but no less important, its worth a trip. First off on our visit is the neolithic chambered cairn of Cuween Hill. Constructed over 4500 years ago, this stands over 2 metres tall inside. Historic Scotland has thoughtfully provided a torch for you to grab before you enter the gated narrow passageway but the batteries were as long dead as the 8 human remains that were found inside. Also inside, the skulls of 24 small dogs. We didn’t have the heart to tell Lord Nelson, he was already traumatised by the ferry trip and now he’s inside a tomb wondering why the smell of ancient dogs is hanging around. Magnificently tall. You see these stones long before anything else around the Brodgar area. Raised 5000 years ago, these four remaining stones are up to six metres eight. As if neolithic man didn’t have enough to do, slogging these stones from different parts of Orkney would have been a mammoth undertaking. Estimates suggest 50,000 hours to build the circle and henge. That’s nearly as much time as we spent planning our Orkney trip. I’m just glad Nelson didn’t wee on them. A well preserved and a free to visit tomb. Even better that there’s no hoards of people. This cairn located on the scenic shore Loch of Stenness looks like a smaller version of Maeshowe but built differently inside with stalled burial compartments. Unstan is notable for the pottery that was found inside and gave rise to Unstan Ware that was found around afterwards and thought to date back to 3000BC. An undignified shuffle will get you through the narrow passageway. The sea is everywhere in Orkney. Wherever we drove, you were always reminded that you were on an island as the fantastically blue sea was always in view. Some of the islands are connected by the Churchill Barriers, constructed after the sinking of the HMS Royal Oak and the loss of 834 lives in 1939 by a German U Boat that had penetrated the previous blockship defences of the scuttled German fleet in WW1. Some of those scuttled boats still jut out of the water at Scapa Flow and reminds me of the boats in the harbour at Stanley in the Falklands. The barriers were constructed with the help of Italian prisoners who also manged to build themselves a little Italian Chapel. Another tomb but one with a more personalised experience. This tomb was discovered by a local farmer back in the 50’s when he was looking for some stone for his farm. Digging by a wall he found some axe heads a a few other items, kept on digging and uncovered a stone chamber with human skulls and eagle bones inside. Recognising that he was coming across something quite significant, he contacted the archaeology department who took 18 years to come out. So he opted to continue on his own and the Tomb of the Eagles is still run by the family now. It’s a more personalised experience with hands on artefacts, talks on the discovery of the 5000 year old neolithic tomb and how the bodies were excarnated before being placed inside. In the end, 16,000 human bones were found. Its a mile walk to the tomb, located, and I would suggest deliberately placed overlooking a stunning rocky outcrop. To get in to the tomb’s low entrance, you pull yourself along a trolley with an overhead rope. It’s a superb location and on the way back took a walk around the coastal route spotting a group of 5 seals in the water. We were in Orkney for 3 days. There are loads to see, loads to do and in all honesty we should have stopped longer. We should have visited more islands, especially Hoy which looks stunningly moody and impressive as you drive to Stromness. Don’t let the long drive put you off, you wont regret it.